We have been having the most glorious spring weather, and it came super early this year, which means I've been grilling! When I'm in a hurry -- or didn't plan in advance -- I usually just liberally sprinkle whatever hunk of meat I'm grilling with garlic powder, salt and pepper. But when I have the time, I love to infuse the meat with some extra flavor by using a marinade. And this is my go-to marinade. 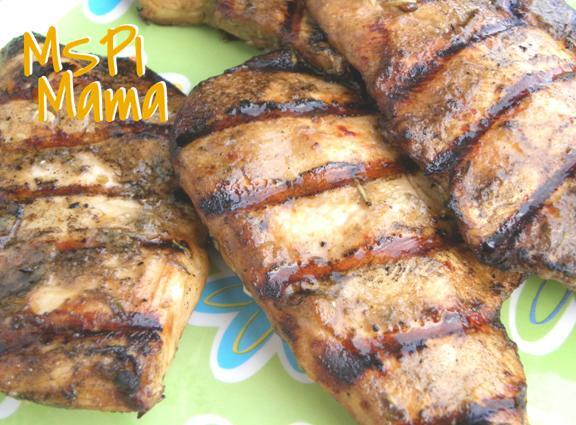 In the picture below, I used the marinade on chicken breasts, but this marinade would work great on pork chops and steaks ... and veggies, too. Just be sure to marinade the raw meat and veggies in separate containers. Combine all the ingredients in a large resealable plastic bag. Close the bag and shake to combine all the ingredients. Open the bag, drop in 1 pound of meat of your choosing. Close and shake the bag to coat evenly. Place the bag in a large bowl in the refrigerator for 4-12 hours. If possible, shake the bag every few hours to redistribute the marinade. Heat a grill or grill pan. Remove the meat from the bag and dispose of the bag and the marinade. When the grill is hot, place the meat on the grill and cook until cooked through. Allow the meat to rest for 5 minutes prior to slicing.